It’s the kind of letter that can make your heart flutter and send an icy-hot flash through your body. But don’t fret. 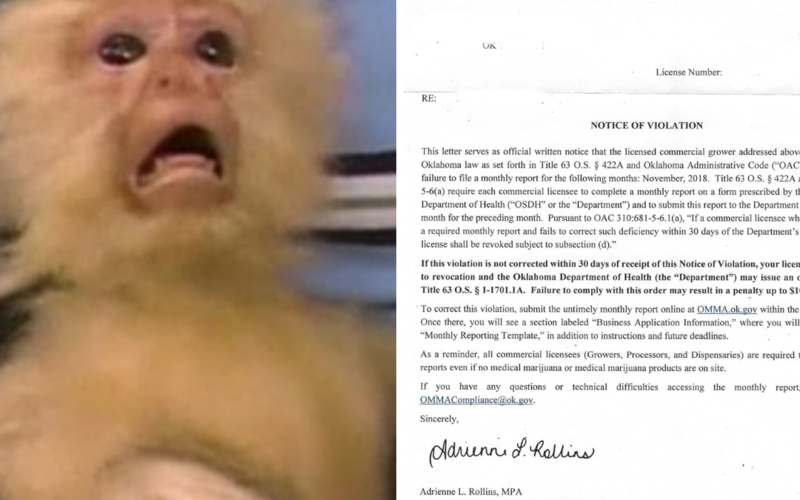 Tulsa medical marijuana attorney Stephen Cale offers some tips on what to do if you get a Notice of Violation letter from the Oklahoma Medical Marijuana Authority (OMMA). The following is for educational purposes only and is not deemed legal advice. If you need legal help for your medical marijuana business, call the Cale Law Office at 918-277-4800. Getting one of these letters can be frightening. You’ve set sail on your medical marijuana business journey. And, the last thing you want is to get shipwrecked. But getting a letter doesn’t necessarily mean that you’re doomed. Carefully read the letter. The OMMA must give you a notice of a violation in writing. Also, the letter must cite the rule and/or statute that the OMMA believes you have violated, said Tulsa medical marijuana attorney Stephen Cale. After carefully reading the letter, here’s what to do next. Some violations are relatively minor or simple. For instance, licensed medical marijuana businesses must submit monthly reports to the OMMA. These reports are due by the 15th “of each month for the preceding month.” (For example, a report for the month of January would be due by February 15th ). A Notice of Violation letter for not timely filing a report will tell the business owner to submit the untimely report within 30 days. Beware! A minor violation can have serious consequences if not dealt with. For instance, if a business fails to comply with filing a report, it could have its license revoked and/or get fined. So, it’s important to deal with this type of violation right away. A licensed medical marijuana business is entitled to a hearing if the OMMA intends to take remedial action, impose a fine, or take action against the license (such as a suspension or revocation). Second, medical marijuana attorneys have specialized knowledge of the cannabis industry, laws and regulations. Think about it like this: if you have problems with your car running, you want you likely want to take it to an experienced mechanic, not someone who “tinkers” with cars. Third, there could be criminal consequences, depending on the violation, said Tulsa medical marijuana attorney Stephen Cale. In this kind of situation, it’s best to let an attorney do the talking first. The last thing that you want to do is make a statement that will get you into criminal hot water. A private audit will help you identify potential violations, some of which you or the OMMA may not be aware of. The Cale Law Office has a proprietary auditing service for medical marijuana dispensaries, growers and processors. The audit will identify areas of where the licensed marijuana business is compliant or non-compliant, where to make improvements, and what laws or regulations could be imposed in the future. Call the Cale Law Office at 918-277-4800 for more information. The Cale Law Office is dedicated to the practice of criminal defense and medical marijuana law. Our mission is to achieve the best possible results for our clients through hard work, attention to detail, and aggressive representation. This is done while maintaining the highest level of professionalism, integrity, and ethical standards. Tulsa medical marijuana attorney Stephen Cale is a Legal Committee member of the National Organization for the Reform of Marijuana Laws (NORML). He has been serving people with legal needs for more than 20 years.